We are proud to announce that you can now get bulk discounts for different image prints on jigsaw puzzles of the same size in the same order. 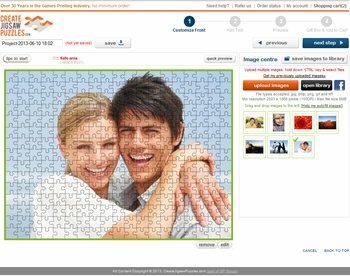 Just add your different image puzzles to cart and the bulk discount will be applied automatically. Enjoy putting your favorite family portrait puzzle together over the weekend. Our puzzles are made of supreme quality paper, wood and plastic for you to add your family photos onto. Shipped worldwide. 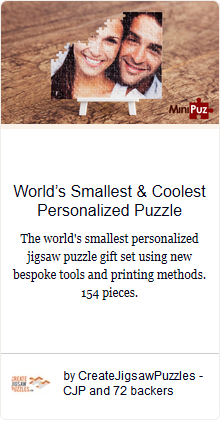 World's Smallest & Trendiest Personalized Puzzle. 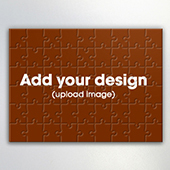 Create and print your own wooden jigsaw puzzles customized with your photos. Choose from different sizes and different printing technologies and different cutting such as traditional cut and irregular knob cut pieces. Comes with an inner sack to put your puzzle pieces into. Do you have a reunion, wedding or promotional event for your business which you would like a guest book with a gimmick? Choose our personalized guest book jigsaw puzzles which are printed with your photo on the front and number pieces on the back with areas for your guests to write their messages and signature. need a romantic photo gift for your wife or husband or would like an attractive photo gift to decorate your office desk? Opt for our plastic puzzles which comes with a high quality heavy duty and elegant photo frame stand to complete the great personalized puzzle gift idea. 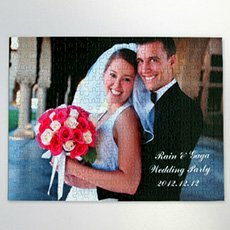 Design your own custom invitation size jigsaw puzzles to send to your party guests, wedding guests or even to a corporate event for your business. 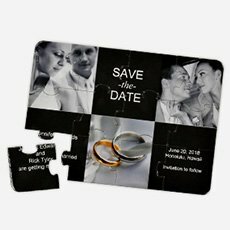 Custom mini puzzles makes a great and unique invitation for any special event at cheap prices. 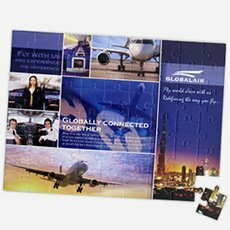 make your own jigsaw puzzles for your corporate clients bearing your company details or design them for your puzzle shop with the best jigsaw puzzle manufacturer for wholesale and no minimum order quantity required. 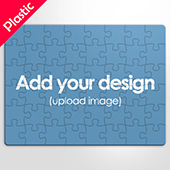 Choose a jigsaw puzzle template and start your own design on our online puzzle maker. Customize puzzle boxes too with matching graphic designs. Great for reselling in retail puzzle shops or as corportae client gifts. 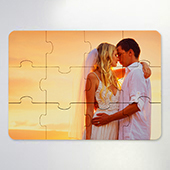 You can create your own photo puzzle in less than a minute with our online maker and have it delivered to your door or to your customers in less than a week, whether you are in the US, Canada, Australia, New Zealand, UK or anywhere else worldwide. Our smart technology will ensure your personalized puzzle designs are made to perfection. 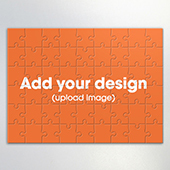 Our intuitive online puzzle builder will allow you to create your design easily and alert you on image resolution issues for printing. We deliver worldwide and all printing and manufacturing are done in our own facilities which undergo strict quality control procedures. We’re world renowned for manufacturing high quality jigsaw puzzles. 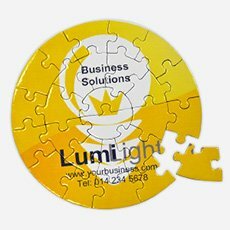 Our customer base ranges from the table top games industry, educational sectors, retail and resellers, travel and hospitality right through to large fortune 500 companies who need custom printed puzzles for their corporate marketing and team building games. One thing they all have in common is their requirement for high quality customized puzzles at low prices and a quick turnaround time. See below for some sample puzzles. 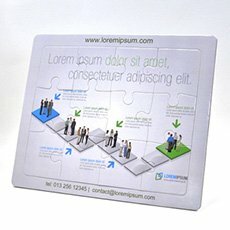 With over 35 years in the table top games printing and manufacturing industry with tens of thousands of customers spanning the world over, we set ourselves apart from our competition through first and foremost, the quality of our puzzles and also through our highly efficient and streamlined production line, we are able to produce your custom puzzle needs in any quantity in record turnaround times. The flexibility of our online puzzle maker allows you to upload your image files and position them for editing before proofing it yourself using our "what you see is what you get" previewer. We have a complete range of popular sizes of puzzles for personalization and a variety of packaging available. We also have double-sided puzzles and magnetic puzzles. If you're looking for a more custom solution, please get in contact with us. Our printing process has been fine-tuned and is very environmentally friendly as going green is one of our top operational priorities. "It was my first time purchasing from createjigsawpuzzles.com, and I am very pleased with the purchased. I ordered the plastic puzzle to be used in an "escape room, " and they are perfect. The image is very clear, and the pieces are indestructible. The predicted shipping time to Canada was also accurate. I recommend this company and look forward to creating another puzzle. " "My brother was getting married so I decided to do a puzzle for him & his wife, using CJP's double sided options. I actually did three puzzles, all double sided, and I wanted them in a single box. 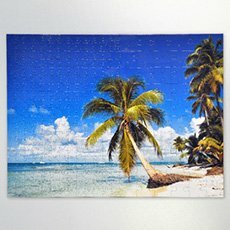 I contacted Create Jigsaw Puzzles, and they made this quite easy. The only problem I ran into was getting my box image uploaded, which I suspect was due to the size of my image (I provided a 600PPI image, and tried a couple smaller sizes, but the upload process always timed out). I provided them with a dropbox link to the image and everything went smoothly. In fact, I had the puzzles in about a week, so that was fast turnaround time. The boxes looked amazing, and with the shrink wrap, I really didn't want to ruin that nice new look, but I really wanted to see how the puzzles turned out inside. Each was contain in its own plastic bag. I asked if they could be mixed together, but I was informed that wasn't possible. I chose a larger box than is normal for the puzzle size, to make sure they would fit. I made 3 500-piece puzzles, which fit nicely with room to spare in the 2000 piece box. These puzzles were probably the highest quality puzzles I've ever seen. The cardboard stock was extra sturdy, almost feeling more like fiberboard than cardboard. Printing was flawless, and not a single piece was bent or peeling. I ordered two copies, one for me so I could see the quality, and one for my brother. I was very impressed, both with the quality of workmanship, and the quality of service, especially since I had some custom requirements. Everything turned out better than I expected. "